It is Rififi with catnip. Two crooks think they have their caper in the bag when they enlist the unwittingly help of dozens of mewing stray cats. Yes, but French noirs usually end badly, don’t they? Such will be the case for the luckless losers in Alain Gagnol & Jean-Loup Felicioli’s animated short Un Plan D’Enfer (trailer here), which screened during the 2016 Fantasia International Film Festival. Plan is really just a morsel from the filmmaking duo responsible for A Cat in Paris and Phantom Boy to tide us over in between features—but it is a tasty one. Once again, they engage with the cinematic vocabulary of film noir, directly tipping their hats to the Jules Dassin classic. Mo and Carl expect to have all night to chop through the floor boards to their anticipated loot, because the racket of dozens of stay cats they have hopped up on pure catnip extract will mask the sounds they make. That’s the plan at least, but we know what that’s worth. Like all of Gagnol & Felicioli’s films, Plan is visually stylish and elegantly droll. It lacks the emotional pop of Cat and Boy, but it cranks up the irony in its place. It’s a shorty, but still a keeper. 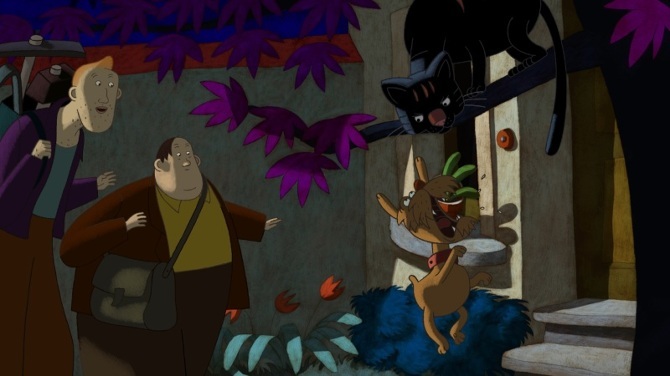 Recommended for fans of film noir and animation, Un Plan D’Enfer had its Canadian premiere at this year’s Fantasia.